My brother forwarded me your email and I was unaware that the 1st Kulai BB has now attained its 48th anniversary. My congratulation to all current and existing members in achieving this exciting milestone. Great job to all those who have given their time and troubles in setting up a website to revive those happy old memories. I may be able to help regarding your early photos of 1959, I believe that the group members are of the two Chai brothers whose Dad(Church memnber) owned a furniture shop opposite the Bright Cinema. Meng Heng( younger one) is on the extreme left and Meng Huat on the extreme right. 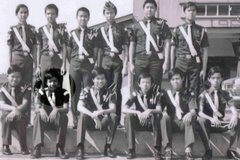 The two gentlemen in the middle appear to be my former BB officers ie Ong Kok Ngee and Kam Kok Fong. All these gentlemen were former neighbours. I have a couple of group photos in my possession taken in front of the Kulai Church(around 1964/5) when the 1st Kulai BB was revived from hibernation. In the group we had the Girls Brigade lead by the Late Ms. Agnes Richards and Joyce Lovewell. There is another taken on our comibined food fair with the then Johore Tengku Makota's wife in attendence. Could be your current Sultanah of Johore. You are welcome to have these if I find them. I shall catch up with you when I am next in Malaysia. My best wishes to you and your members in the coming years. the supplies well-nigh anywhere, charms, string, dangles, particular clasps nonnegative often many. indefinite amount shin you want to fix yourself and happen off easily. as a requisite and incidental items you trade and how cursorily it can be your Quaker.